Hello everyone and welcome back to Mama Elephant’s June stampede! I can’t believe it’s already June… almost done half of 2018! Today, I’ve got a card to share with you using the newly released Dandelion Wishes. This is my favourite set from this June release so I’m super excited to be able to share my card with you during the Stampede! I created a little scene using the little raccoon (tanuki!) and decorated the field with the mushrooms and the dandelions. I thought the card was a little plain around the middle so I used the tiny dandelion stamp and stamped it around the card to finish it off. Now let’s get on with the Stampede with our amazing designers! I love this stamp set, it must be my favorite from this release, and your card with it is really cute! OH my goodness! Such a cute card! Love the little raccoon blowing the dandelion! So cute and love all the little details! So cute. I like how you stamped with the little dandelion stamp all around. Your card made me smile, it is so playful! What an adorable, sweet card. It is a powerful force of CUTENESS here! So cute! Love the little dandelion seeds flying all over the card! Your forest animal card iscsuper adorable! Love it! Adorable!! I love this set & your card is so cute! Thanks for sharing! This is lovely! 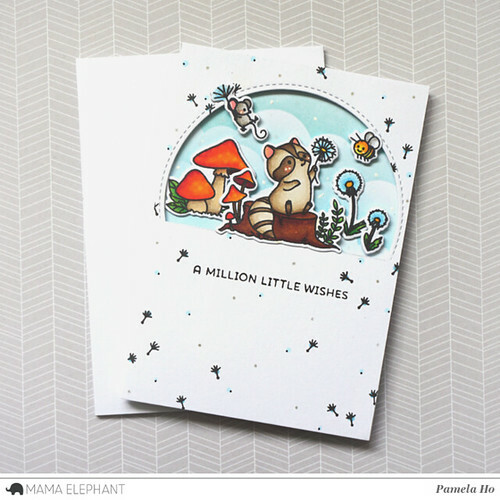 Your scene is so sweet, and I like how you’ve used the little dandelion seeds all over the card base as a sort of pattern. It enhances the “wishes” of the sentiment really well. 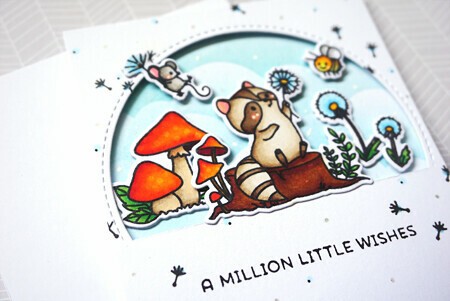 These critters are so cute on your fab card. Thanks for the inspiration. This is just so darn cute!!! WOW!! I love the way you framed the scene and then added all of the dandelions to the white background- it is perfect! Love the addition of the dandelions!! This card is so sweet! I love the dandelion background and the delightful scene! Love the small details you’ve added! What a cute card – I love the scattering of dandelions! Stamping those tiny dandelions all over the card really made a difference. Thank you for the inspiration, Pamela. So adorable! I love your card design. Awesome card! That little mouse is so cute. This is absolutely darling! I love this set and love the randomly stamped dandelions on the base! This scene is so cute! Oh my !! This is such a cute card !! I can’t resist such an adorable little raccoon !! Such an adorable scene…love the design with the half window. This is a wonderful card! I love the extra dandelions on the front of the card.